Home Stylista Magazine DITCH THE DIET AND MASTER MINDFUL EATING INSTEAD. Mindfulness has been all the rage recently, and for good reason too. It is such a simple concept, and probably one of the most valuable habits you could add to your life. That being said, the reason more people aren’t successfully managing to maintain their mindfulness habits it that it takes a concerted effort to implement on a daily basis. Also, the payoff is not immediate and so people give up without ever experiencing the rewards. Do not fall into this trap – read on and complete the mindful eating challenge below! The issue is that you really have to commit to practicing it – with mindful eating you have to use an entire meal as an opportunity to hone the skill. You can’t quickly check Facebook and then spend the second half of your meal being mindful. Think about it as a workout for your mind. Put your metaphorical gym clothes on, go sit down at the table, and commit to exercising mindfulness from the beginning to the end of your meal. Lets hold up for a second… What exactly is mindfulness? Mindfulness refers to a state of consciousness that involves you fully engaging in the present and accepting your thoughts and feelings without judgment. It is very useful to help manage stress, improve health and assist with overall happiness. Mindful eating specifically is applying this concept to the consumption of food, and employing the strategy as a way to heal any unhealthy relationships you may have with food. It might sound quite frivolous but I quickly learnt how powerful it can be when I started implementing it into my own life. If you struggle with obsessive thought patterns (like I do), they can sometimes leave you feeling trapped and desperate, which can result in an episode of overeating as a distraction and a feel good quick fix. The problem with this is that is very short term relief and usually leaves you feeling worse afterwards. It was after many cycles of this overeating and then devastating guilt that I looked to mindfulness to quiet my mind, and not to food. MINDFUL EATING MEANS THAT YOU PAY FULL ATTENTION TO WHAT YOU ARE EATING AND TO THE EXPERIENCE OF IT. This helps you stay in touch with your internal cues of hunger and fullness, and also assists with coping with guilt and anxiety around food. This reduced stress around food aids digestion, increases enjoyment of food, and lessens the sense of struggle around controlling your eating. Eating can become a mindfulness ritual that is a part of your day where you unwind and reconnect with the present, as opposed to a rushed or stressful experience. Many people have found that weight loss was natural side effect of mindful eating, because as you heal your relationship with food you are less likely to overeat, binge on unhealthy foods and you in turn make healthier food choices. What I like about this practice is that it is a behavioural one that will automatically spill over into resulting actions, but is not based on that. I am a firm believer in mastering your mind and habits because these are transferable across different scenarios, and are therefore more sustainable. 1. Remove all distractions around mealtimes. Don’t eat in front of the TV or while you’re on your phone; sit down at a table. 2. Decide on your meal portion before you start eating, making sure it is balanced and that you are pleased with it. 3. Eat slowly, taking small bites and chewing well. 4. Focus on your senses while eating. How does the food smell? How does it taste? Notice the textures. 5. Try putting your fork down between mouthfuls, and taking a few breaths. 6. When the meal is finished, think about how full your stomach feels, and use that to stop you from eating more as opposed to using willpower. 7 .Spend a moment after eating feeling grateful for the food and your amazing body, and do not allow any feelings of guilt or regret about what you just ate to creep in. 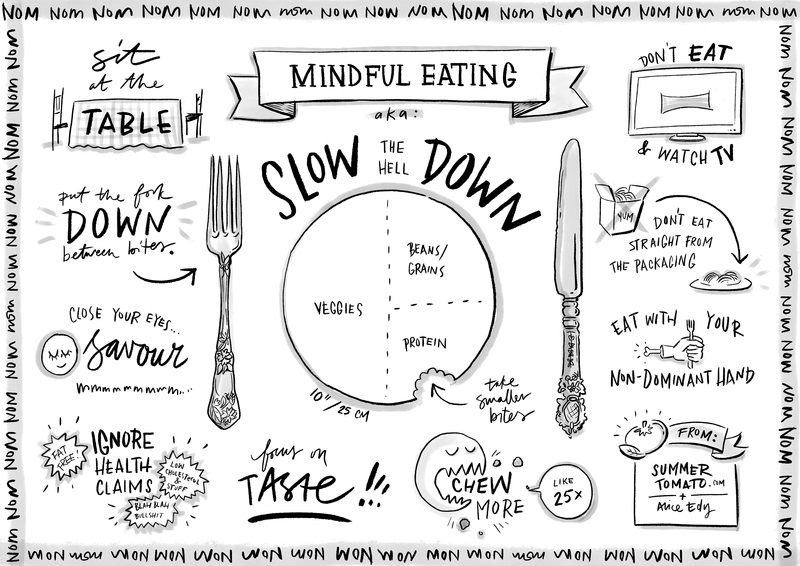 I’ve attached a cool image I found online of a placemat that you can print in A4 that is filled with mindful eating cues. Print 5 copies, and commit to eating mindfully for one meal a day for 5 days in a row. Leave the pile of placemats on your table so that you don’t forget, and grab one when you want to eat your ‘mindful meal’. I think its an awesome way to start building the habit, and keep yourself accountable. Click here for the full size image.